All transactions are safe and secure with a reliable history in online purchasing behind each of our associates. 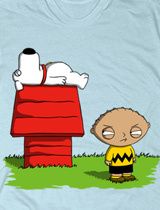 Buy the Stewie and Brian Peanuts t-shirt to own Family Guy clothing and merchandise. If you're a fan of Peanuts, this costume Stewie t-shirt displays Stewie in a Charlie Brown costume. Stroll around Quahog in this Family Guy t-shirt design that features Stewie and Brian playing the roles of Chuck and Snoopy. Don't worry, it's easy to love him in spite of his disobedience, attempted matricide, possession of an illegal death ray, and dumping of toxic diaper waste. Add a Most Wanted poster for the perfect gift. In addition to the Stewie and Brian Peanuts tee above, browse the Family Guy Clothing Gallery for more apparel like men's and women's clothes, kids shirts or hoodies.